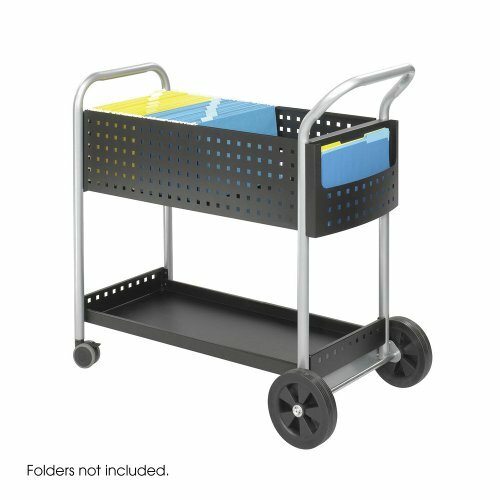 Save 1% on the Safco 5239BL Scoot Mail Cart, One-Shelf, 22-1/2w X 39-1/2d X 40-3/4h, Black/silver by Safco at Momiji Studios. MPN: 5239BL. Hurry! Limited time offer. Offer valid only while supplies last. Boot Scoot and boogie through your day The cart features all steel construction for a durable product with modern styling for use around the office. Boot Scoot and boogie through your day The cart features all steel construction for a durable product with modern styling for use around the office. Over sized casters, convenient handle and side pocket makes this cart easy to use. The top basket will hold legal sized folders and the bottom shelf will hold packages of various sizes. A lip around the shelf keeps packages from sliding off in transport. 3" front swivel casters and over-sized, 8" rear wheels makes for an effortless office round. Wheel / Caster Size: 3" dia (locking casters), 8" dia. wheel. Capacity - Folder: 120 Legal Folders. Finished product dimensions: 22 1/2"w x 39 1/2"d x 40 3/4"h. Finished product weight: 46 lbs. Color: Black. Actual weight: 55 lbs.